Dress shoes and boots are pretty easy to find. But something that looks cool and trendy and up to snuff isn’t. But does it always have to be that way? Well! We got you right there. You’re looking for a pair of black sneakers to be your partner with almost every casual dress. So, instead of taking stress as to which shoe will go with a particular dress, set your shoe game up by selecting a pair of sneakers from our list below. As every other brand is making sneakers these days, it has become troublesome for a consumer to choose the right one! So, go through our list of black footwear for women & men to find out a perfect pair for yourself. 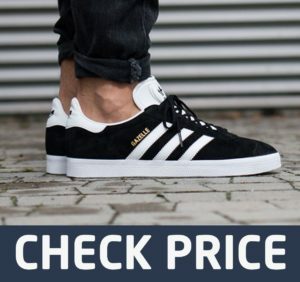 The market is flooded with millions and millions of sneakers for men, but what makes Adidas stand out from all, is its timeless comfort and the same attribute is characterized in the sneakers of its Gazelle series. This pair of cheap black shoes provides utmost comfort and is ready to go with almost every outfit. Carry them with a pair of jeans or PJs; with these affordable black sneakers by Adidas, every look will come out quite trendy. The design was first launched in 1968 with an objective to provide comfort to the athletes. And it is safe to say that Adidas is adhesive to its legacy even now in the form of Gazelle, sometimes also known as Gazelle 2. The sole of the sneakers is made with rubber and provides all the protection that is needed by your feet and the 3 stripes branding design gives these sneakers a classy look. The reinforced toe is thin and doesn’t feel floppy at all. The black color of the Gazelle can handle any situation effortlessly. Gazelle is Adidas’ ageless creation that is made with premium materials and want, to know the best part? The premium shiny upper is durable and doesn’t wear out quickly. The pair is lightweight and doesn’t seem clunky. These sneakers by Adidas have the attribute to fit well in both summers and winters. And this is nothing but crazy! Looking for a running shoes that provides both comfort and stability? Asics’ Gel Quantum 360 Running sneakers will get the job done. 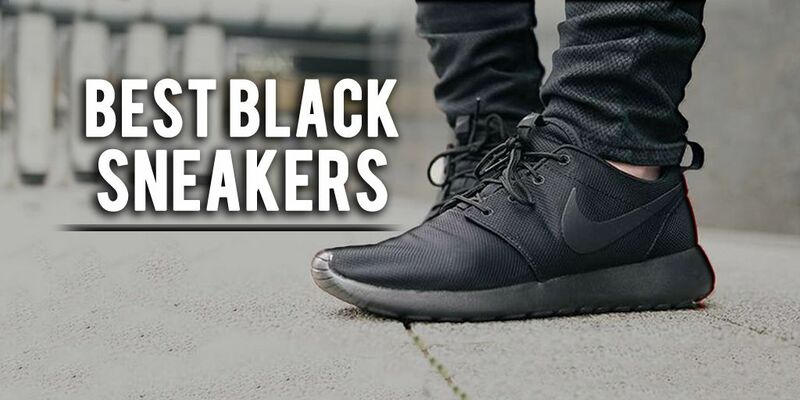 Want to know the crazy part about these all black footwear? This extremely lightweight runner features gel cushioning along the midsole which is revolutionary in the category of running sneakers. This makes it one of the best you can get in the market. And yes with these sneakers you get 360 degrees of gel. Isn’t it crazy? Besides being excessively cushy Asics’ Gel Quantum runners carry an exclusive outward identity. These black colored sneakers look cool and trendy. The upper fabric is extremely soft and blends well with the movement of the foot. The fluidFit upper fits well and provides an assertive look to the kicks. The shoes somehow mimic the actual shape of the feet. Therefore, provide a perfect balance to the runners. Get these road runners now. And experience breathable feet coverage along with reliable cushioning! Looking for something minimalist? You might be wondering how to carry your old bulky sneakers while traveling. This is for the people looking for black colored runners by Nike. Go for Nike’s Sock Dart black shoes and forget your worries. This Sock Dart’s pair is undoubtedly the most minimalist sneakers in our list of best black sneakers. The pair is extremely lightweight. Hence, is easy to carry while you travel. The thick outer sole is both durable and gripping. The horizontal and vertical flex grooves provide pretty decent traction. The inner sole provides perfect cushioning to your feet. Their black color is unarguably timeless. The storm fit fabric is being featured to save you from snow, wind, in short from any kind of harsh weather condition. Welded seams provide water protection. Some people find the insoles uncomfortable but the company does not offer an option to take the insole out. The storm fit fabric, welded seams, and chin guard are the particulars making the sneakers your perfect partner during voyages, hikes, and treks. So if you’re a fan of Nike, these runners aren’t going to disappoint. When the thing comes to comfort Reebok’s Classic Renaissance sneakers come on top. And you know what, their black color adds a cherry on the top when it comes to the ongoing trend. These Men’s Renaissance sneakers have cushioned support and come with memory tech comfort. Hence, the pair comes out having a shockproof attribute. The shiny leather upper looks super cool and is perfect to go with any outfit whether it be jeans or some comfortable sweatpants. The sneakers aren’t pricey and look classy. The design fits well with the people having narrow feet. Your feet don’t look clunky at all with these sneakers on! The beveled heel is there to enhance the stride. And the low cut construction assists easy moving of the ankles. Want to know the best part of the sneakers? The Reebok branding, undoubtedly, is there to make you stand out from the crowd. Since its origin, the motto of Reebok has been to provide products that possess a variety of features like heritage, class, style, and comfort. And Classic renaissance is also being made with such intent to outperform its competitors in this category. These comfy pair of footwear have the ability to make your ordinary look interesting. I mean they are good to cover your workouts, weekend hangouts and everything that comes in between. So, getting a pair of these would be a good choice for comfort seekers. Nike Downshifter 7 is an upgrade of Nike’s Downshifter 6. Nike has always strived to improve the quality of its products. Same is the case with its Downshifter series. Theses black sneakers by Nike are getting better with every new version that is coming. The sneakers possess many great things when it comes to comfort and style. Nike is famous for being on the forefront when you talk about adopting new technologies. In its Downshifter 7 series, Nike has added flex grooves in the outer sole of the shoes that provide an ultimate durability to the shoes. The lightweight phylon makes the midsole extremely comfortable. 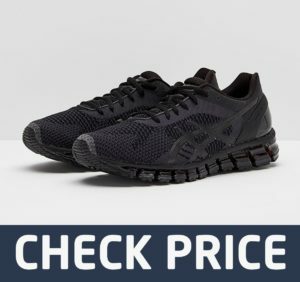 And the affordable price of the runners put them right up in the category of affordable black footwear of 2019. This budget-friendly pair is perfect for your daily usage. They also fit well for some light workouts. The lining is made of breathable material that provides an adept in-shoe feeling. The lace-up closure is there to fit them perfectly on your feet. 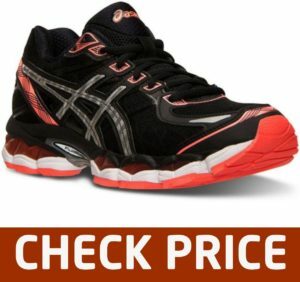 Its affordability makes it one of the best footwear for people who are on a budget. These black beauties go very well with casual tees, pants, and with almost every outfit that you wear! 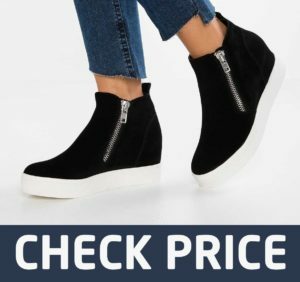 Therefore, these cheap sneakers for women deserve a shout out from all the comfort seekers out there. 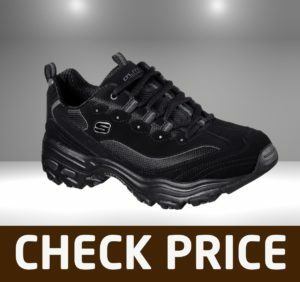 Skechers knows that all its customers want is comfort and style. So it presented both to them in the form of D’Lites sneakers. 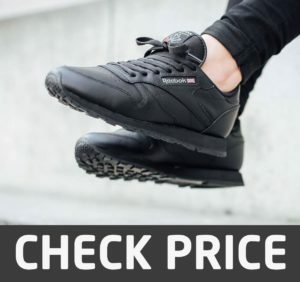 These affordable black sole are not only cheap but also attractive. The upper sole is made of leather and adorned with beautiful contrast inlays making these sneakers trend worthy and eye-catching. Now come to the attributes making these sneakers utmost comfortable for the runners. First, a padded collar on the sneakers is there for not only ankle support, but for additional comfort. Second and most important the thick midsole assures shock absorbance. This hidden yet thick sole makes these sneakers a higher heeled one. What sets them apart is the thick sole. I believe most women out there want higher heels as they are good for the ones with bad backs. And this is what the thick sole is providing! You can use these with almost any outfit being it pants or a gym suit. And the guarantee is that D’Lites by Skechers can make you look effortlessly chic. And loosening up the laces of the sneakers can take those casual vibes to another level. You’re getting the best features covered in just one product. Like thicker sole and comfortable higher heels. So ladies hurry up and get these affordable pairs to take your comfort and style to the next level! ASICS Gel-Evate 3 women’ sneakers are designed with the luxurious cushioning and extremely comfortable material. Guess what the company works on the slogan of ‘a sound mind within a sound body’. Therefore, strives its best to provide utmost comfort to its customers who are looking for best sneakers in the market. FluidRide midsole and ForeFoot Gel cushioning in the sneakers make running and workouts much more fun. The extra padding in the heels works wonders for the women with aging bones. And the removable sock liner is the cherry on the top as it is there for an enhanced cushioning performance. Vertical flex groove provides ameliorated gate efficiency. These Gel-Evate sneakers are your good partner whether you run street, forest, trail, or sand. 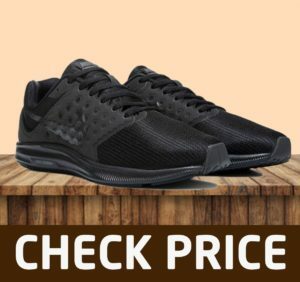 And what is even more delightful is their beautiful black color that makes these kicks perfect for the women looking for something that is easy to immaculate. This is crazy as these kicks are perfect for the women who have knee and back issues, ideally making it one of the best option for extra cushioning and support. The cutting-edge technology used in these black beauties makes them perfect for walking. So it is safe to say that ASICS Gel-Evate 3 could unarguably be your next best athletic shoes. Looking for something sleek, sophisticated and yet modern? Here is the deal: Go for Steve Madden’s wedgie sneakers and make your appearance look enthralling. The extremely soft suede upper not only provides comfort but is easy to clean as well. And the nice black color goes well with any of your outfits. The hidden wedge sole adapts well to your feet. Lace-up design and dual side zippers adjust to your feet robustly. These dual zippers are designed with an edgier soul hence is good to add approximately 2 inches height in your overall appearance. And the pair goes perfectly with every outfit whether it is a dress or a suit making it one of the best ones that you can buy. These beautiful black pairs have the ability to make you stand out of the crowd. So don’t procrastinate. Buy this uber chic pair of Steve Madden’s wedge sneakers and be your own fashionista! Sneakers should be airy and while their fabric should be durable and comfortable, it shouldn’t lose its color and texture. Sneakers should be lightweight and raised. They should feel like they are a part of the athlete’s feet and should be more like an extension of the athletes limp than an extra weight he or she is carrying. They have a unique property when it comes to branding. 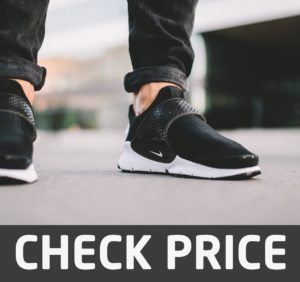 Spending some extra money and buying sneakers from a reputable brand will pay off big time in the long run. Buying from the right brand will enable you to make the most of your shoes and they will definitely last longer than they would have if you had bought shoes that weren’t branded. Shoes should be adjustable and flexible and should have a design that’ll look good under the widest range of clothing options possible. When buying shoes, their durability should always be kept in mind. Sneakers should be long lasting and should be able to withstand weather and water without showing too much wear. Everyone needs sneakers in black because it’s an essential color that goes with almost everything. It goes to show that you can never go wrong with black sneakers or white sneakers. The list of best black sneakers is never-ending. But we’ve tried including the ones that are comfortable, classy, and reasonable. You’ll find the big names like Nike and Adidas, similarly, you’ll also get to know about the lesser known brands like Skechers and ASICS. Buy the pair that fits best to your needs. And don’t forget to share your experience with us!